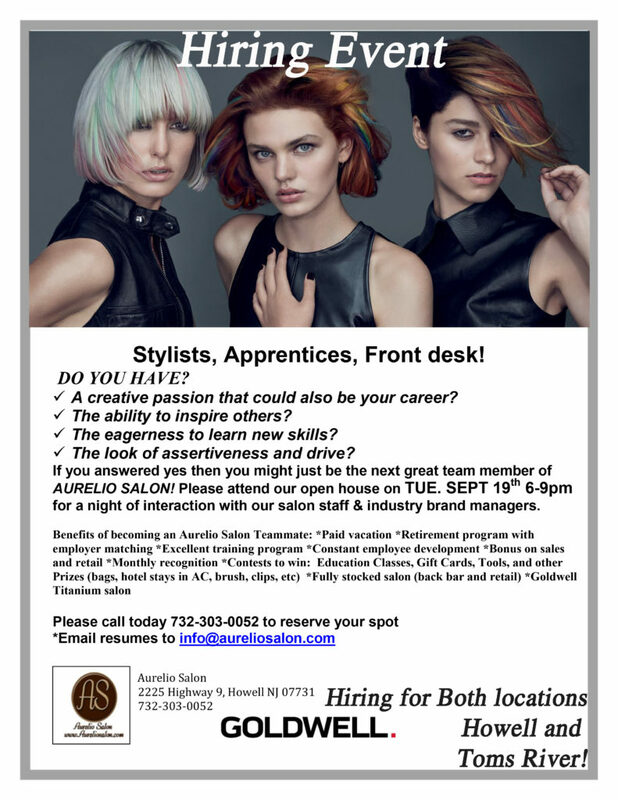 Aurelio Salon is Hiring! Join us for our Hiring Event! Coming 9/12 AMERICAN WAVE by ARROJO! AVAILABLE in Both Howell and Toms River Locations! Book your now and save $50! Only at Aurelio Salon! ARROJO’s American Wave creates soft, natural-looking waves and curl patterns for today’s style-conscious clients. We use an innovative, ionic waving lotion the product penetrates the hair shaft gently,unlike the old-fashioned perms. The ionic lotion reduces the stress on hair, and makes hair fabulous and full. With American Wave we can make hair more or less wavy or curly; we can use it to control frizz, add texture, movement or volume. It’s long-lasting, with loose waves only needing a redo every three months. Best of all it smells of eucalyptus. Aurelio Salon now offers online booking for our Guest! Aurelio Salon, Monmouth and Ocean Counties Top Salon is pleased to offer online booking for several services. You may now book you haircut, color services and more from the comfort of your own home or when you are out and about. It’s easy to get started just follow the following directions. New guests to the salon just click on the location your wish to visit below and follow the walk through. If you have been to the salons you already have an account and we need to activate it for online booking, just call or email the salon and they will give you your username and password. Click the link location you wish to visit above and follow the walk through! Save the Link to your Home Screen or Bookmark it for easy access next time! Now At Aurelio Salon Macadamia Boar Bristle Brushes! Macadamia Natural Oil has launched a line of Boar Bristle Brushes! These brushes are 100% Boar Bristle and are great for Hot Curling and are specially designed for ultimate heat styling. Why should you buy a Boar Bristle brush? Boar Bristles maintain the hairs natural health and shine leaving hair smoother, shinier and more manageable. The multi bristls grab and help bush the hair more effeectivley then other brushes. Available in Small, Medium, Large and Extra Large. 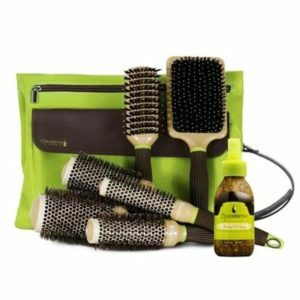 these brushes enable you to create curls and volume to suit your style. If you didn’t think the hair industry could be any better, it’s time to start second guessing yourself! Kerasilk has created lines not only to fulfill the needs of those who need to smooth their hair, but now to meet the needs of those with color treated hair, limp hair, and damaged hair. These lines all contain the KT3 technology that was built into the original Kerasilk line, but each has a specialized ingredient to attend to the variety of frustrated strands. To brief you on KT3, it is a technology based with keratin to give your hair structure, lightweight silk to protect your color, and the third ingredient is a contributor to the specific issue with the hair. The color line of Kerasilk has tamanu oil as the contributing ingredient for color protection in its KT3. Its technology has a refraction index allowing it to reflect light and shine in the same way a diamond does. So diamonds are not only a girl’s best friend, but now your hairs best friend thanks to Kerasilk. The take home care is guaranteed to preserve and enhance your color like you’ve never experienced. The Repower line is accented with elastin to bulk and lift hair that is limp and lifeless. The combination of KT3technology with elastin gives volume unlike any other volume product! If you’ve struggled to have volume with shiny, healthy hair repower is THE BEST product for you. It gives you silky, weightless hair without giving your starchy roots or dry ends (those who have struggled with having nice full hair know this exact situation). Now for those with structural damage and chemical damage, Reconstruct has the power of hyaloveil to reconstruct the hair and create a protective barrier surrounding the hair. The damage of past lightening experiences and over dosage of hot tools will no longer suppress your hair from looking its absolute best! Now all of these amazing subcategories have advanced treatments to last up to 10 weeks after receiving your service! Consider it a conditioning treatment on steroids. Now what’s stopping you from indulging in one of the best hair care lines on the market right now? Stop in at any of our salons and talk Kerasilk with your stylist! Are You Worth An Upgrade? 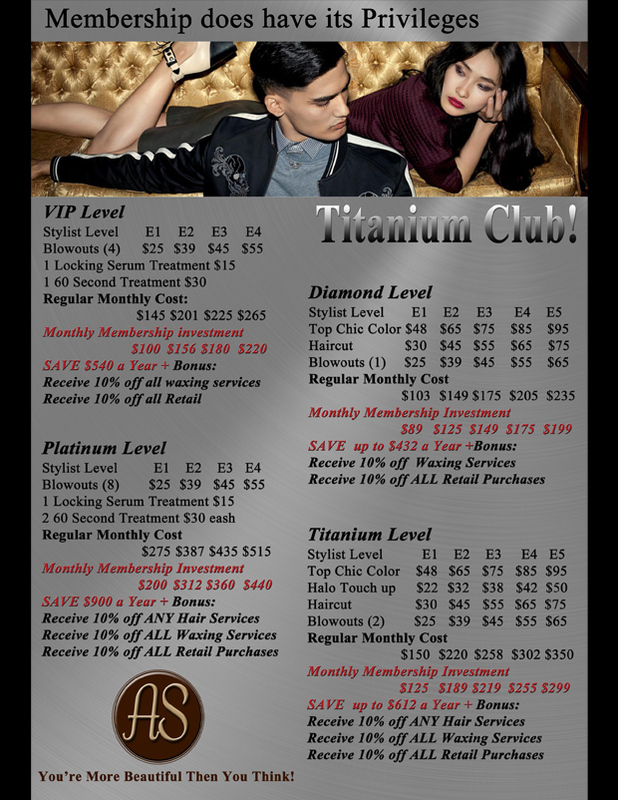 Aurelio Salon introduces our upgrade Menu. Treat yourself to an upgrade. Click to Schedule Appointment for Howell or Toms River! Nectaya™ Nurturing permanent color formula with naturally derived ingredients. • Elumen® Innovative technology (magnetically attractive!) 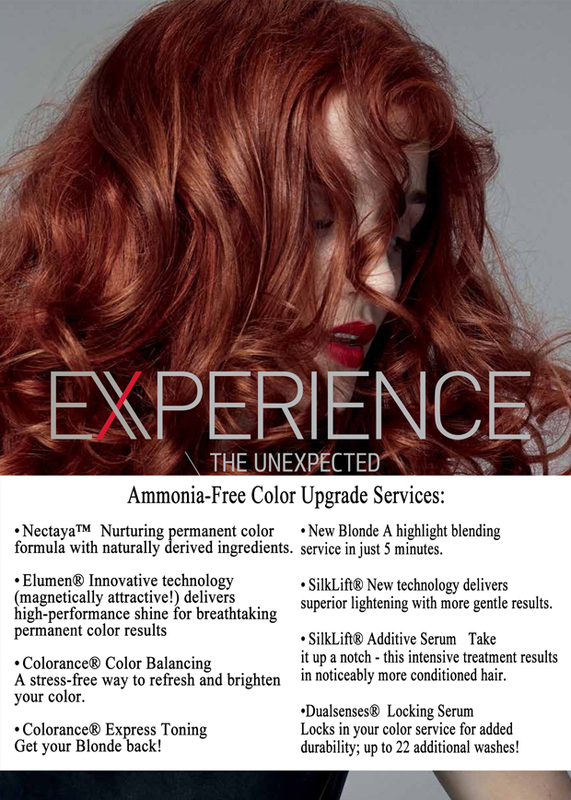 delivers high-performance shine for breathtaking permanent color results • Colorance® Color Balancing A stress-free way to refresh and brighten your color. • Colorance® Express Toning Get your Blonde back! • New Blonde A highlight blending service in just 5 minutes. • SilkLift® New technology delivers superior lightening with more gentle results. • SilkLift® Additive Serum Take it up a notch – this intensive treatment results in noticeably more conditioned hair. •Dualsenses® Locking Serum Locks in your color service for added durability; up to 22 additional washes! Memberships are now at Aurelio Salon! Join the Titanium Club! 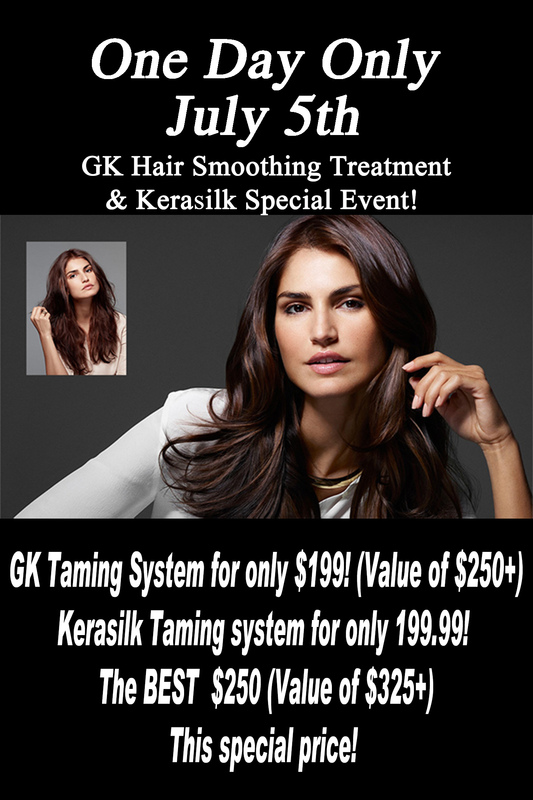 GK fast Blow DRY smooths and tames hair, helps prevent breakage, and cuts your blow-drying time down by 50%. The best part of all the GK Fast Blow-dry is Fast & Easy. 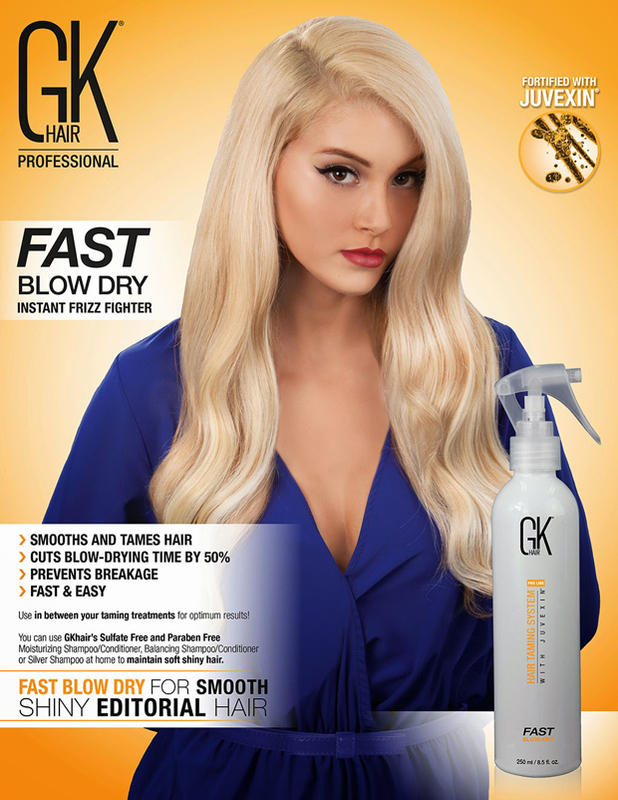 GKhair’s NEW FAST BLOW DRY contains a concentrated dosage of JUVEXIN, which allows you to experience the benefits of amazing shine, frizz free and smooth hair. The product enables the hair to fight against the effects of humidity reducing styling and drying time.